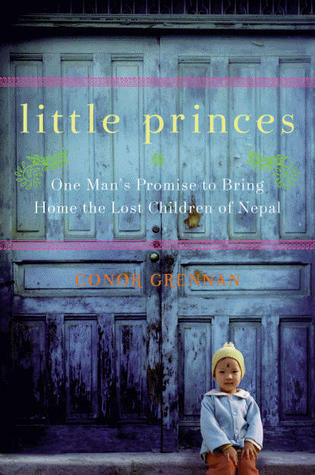 Goodreads: In need of some fun and adventure, 30-year-old Conor Grennan traded in his day job for a year-long trip around the globe, a journey that began with a three-month stint volunteering at the Little Princes Orphanage in war-torn Nepal. But what began as a lark became a passionate commitment that would transform the young American and the lives of countless others. Kritters Thoughts: A wonderfully heartwarming read, that I completed exactly one week before Christmas. A story of one man's mission to help the orphans of Nepal regain what they lost and the parents of these children realize what really happened when their children were taken from them. I had the hardest time understanding why these parents trusted someone to take their children from them for a price and not do some research to confirm that their children would be completely taken care of. Parents going into grave debt to send their children away for a better future - that I understood, but to not know where they were actually headed was something I could not put my head around. The lengths to which Conor went to help these families reunite kept me absolutely engrossed in the book. Anyone with a child they hold close or who love stories about non-profit work that changes lives - those are the people that I would pass this book off to. I received this to review, but I am absolutely glad I took the time to understand how a country across the world handles their impoverished and most needy. GR Oct-Dec Challenge - Happy Birthday! I got this one for review via LibraryThing and haven't read it yet. I figure it will be an emotional read, but it's nice to know it's also a good read.